I will be delivering my next workshop using the latest version of iMovie. Despite several incarnantions of the new iMovie it was never suited to processing still images with precision. This made the creation of digital stories more an exercise in trial and error in equal quantities. Last month iLife ’11 hit the streets. It brought a timeline to the video editor for the first time since iMovie HD and so I felt it looked promising. A number of bugs in the processing of still images have also been removed and I began to feel confident that it would work for my purposes. 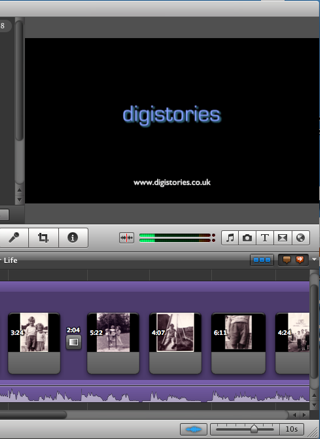 The first test of a new piece of video editing software is to build my digital story Affected for Life? This is the one I use in every workshop as a tutorial. After the first build I was partly convinced and hoped that the problems I still faced were caused by being unfamiliar with the interface and menus. I was driven on because iMovie HD is no longer available and even if you can pick up a copy it doesn’t work under Snow Leopard. Even in Leopard you have to regress Quicktime to an older version to process still images properly, and stills are the bread and butter of digital stories. So anyone with new Mac would be finding my tutorials of little use except to learn the principles of digital storytelling. So it was with great relief and some excitement that I successfully created a workflow in iMovie ’11! So having built Affected for Life? as a new tutorial digistory I have begun to rewrite the iMovie section of my tutorial manuals for my next training workshop in a couple of week’s time. One disappointment about the timeline in iMovie ’11 is that the audio isn’t displayed until images are added, so I have created a template with a series of placeholder images. When the audio track is dragged into the timeline the sound waveform is displayed beneath them. I feel it’s easier for newcomers to digital storytelling to be able to see the beginning and end of their audio and to observe the progress of building the images in the timeline. The place holder images simply move down the line as new pictures are added. Once the last image is inserted the placeholders can be deleted. I am quite excited by the potential of some of the new features in iMove ’11. Picture in Picture and Side by Side pictures have a lot of potential. The Precision editor is also excellent for trimming the start and end of clips and for adjusting transitions. The Ken Burns Effect is also easier to set up – although it doesn’t have the nice ‘s-curve’ motion of iMovie HD. I now feel that iMovie ’11 is a worthy successor to iMovie HD. I’m sure there will be issues but as with any piece of basic software I’ll have to find a way of working around the shortcomings. That’s part of the fun – once you’ve overcome the apprehension about making it work properly for at least 80% of what you need. Only now do I feel I have I arrived at that point.